It's weekend, enjoy! The sun is trying to come through the clouds today, so I'm hoping for a sunny walk later on. I am linking to Tag Tuesday, spring / Easter. Love the older photos of family, I have many too of mum and dad and brothers as a child we all were close, now mum and dad gone and brothers are at a distance, wonder if it was all worth it, memories only by photos. Too true, but the memories are there. beautiful personalized tags!! Thats such a lovely photo of your family, lots of smiles, I love the queen bee tag , the crown tops it off nicely!!! Beautiful photos as well, you have such a good eye!! Such a wonderful family page you made! Fond memories of your family! 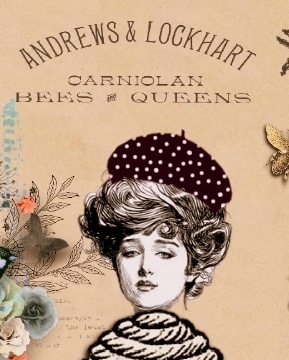 I love the bee tag and the queens crown better than the hat! Brilliant idea! I really enjoyed all your gorgeous photos with sun through the branches and the preety swans! Great captures my friend! I love swans!!! Wishing you a lovely day and a happy weekend! Hugs! Loved the tags, especially Queen Bee. Stay warm and healthy! Another amazing page. 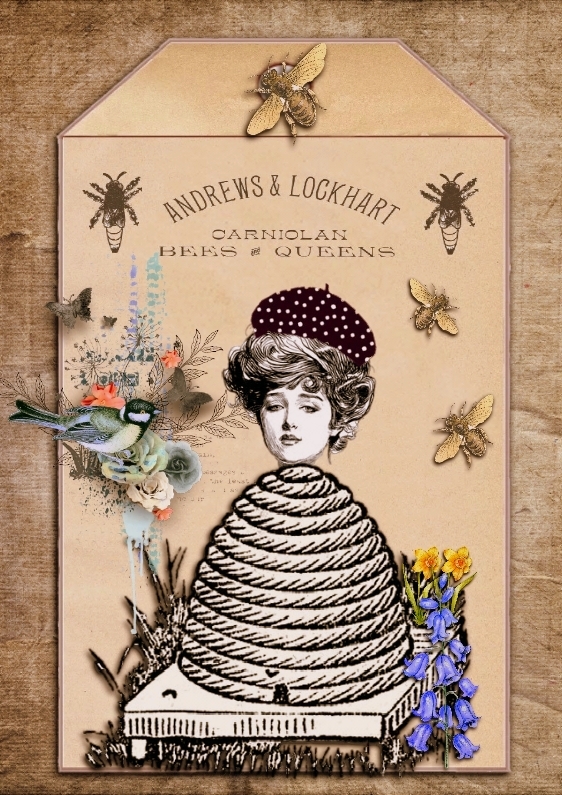 I got the beehive piece mixed up and put the comment about it on yesterdays post-sorry. How lucky to have had so many siblings. Fantastic photographs and good to see the swans.Hope the sun is still shining on you. What a sweet way to use a family treasure. I love those Gibson girls. I don't have a stamp but printed them out. I used mine as pansies in a project. They fit will with so many things especially that crown. You just take the best photographs. The sunrise photos are just beautiful. I like how the swan posed for you. Have a great weekend! Lovely page were you the youngest then? Pretty tag and outstanding photos! I love the art in today's posts -- beautiful color palette in both. And speaking of color -- those sunsets are really quite magnificent. Looks like some beautiful weather for you, but I'll also bet it's colder than it looks! 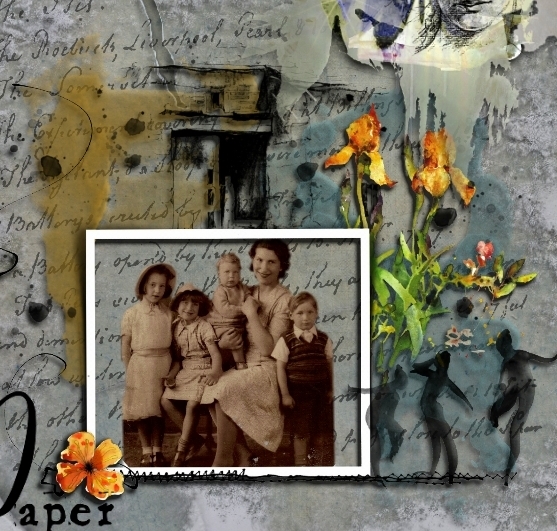 Another beautiful family journal page Valerie, its a gorgeous background as well. I loved both your tags, I think she suits her crown very well. Super sunny photos, I hope you enjoyed your walk today. Love your family journal page!!!! The tags are great too ♥ You always stay so busy. It cloudy and wet here again today but I finally have Daffodils blooming so I am smiling :) Have a great weekend. What a handsome family. You're making such a purrfect family journal. One to be forever treasured. Hope this is the best weekend ever. What a great way to create a scrapbook. So unlike the "usual" ones I see. This is a true mixed media beauty. Your family is truly lovely. The tag you created is beautiful. The Gibson girl truly looked like a queen bee. As usual, photos from your walk are beautiful. I was so impressed with how warm you made these photos look, although I'm sure it was colder than the photos conveyed. Hope your day is going well. How fun to see your family photo and the page you made. I love all the sky pictures. You know I can't get enough of sky and tree pictures. Simply beautiful. So many gorgeous colors. Thanks for sharing. Hope you have a great weekend. That's a wonderful family page you made, and such a lovely selection of photographs. Such a lovely hybrid page. Beautiful family photos. 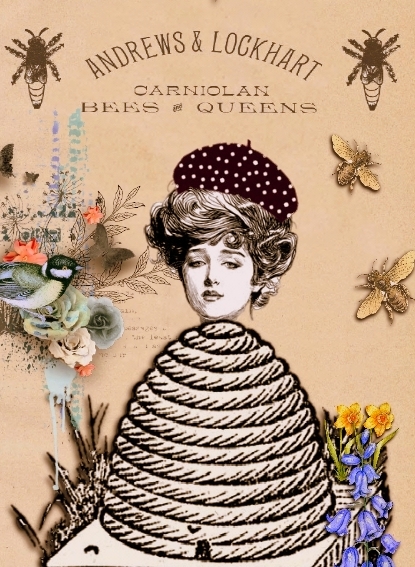 And of course I love the Gibson girl/beehive tag. So creative. Great photos and a beautiful journal page. You are so talented, Valerie. Kisses, my friend. Oh you get me everytime with those family pieces! What a gorgeous family Valerie! So you are the baby of 5 siblings? Your Mum look so pleased and is so beautiful! A great layout you've shared! Those tags are too sweet! No pun intended~ i love the Gibson lady with skep- brilliant idea! and her crown looks as lovely as her tam! What glorious sunshine photos! I swear I felt it's warmth! 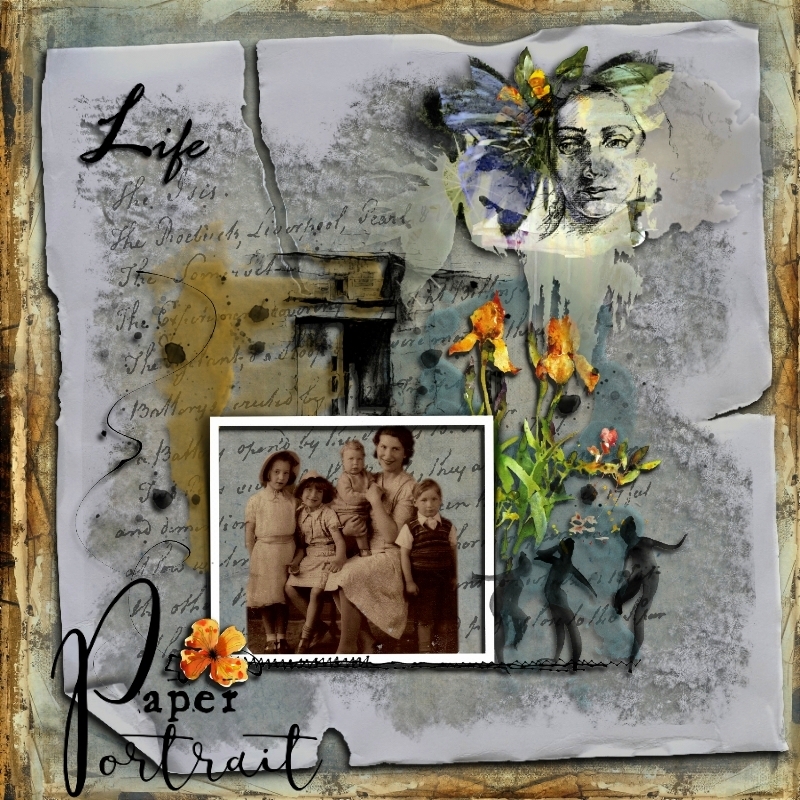 A stunning family journal page, the photo’s lovely and I love your tag - it’s brilliant. 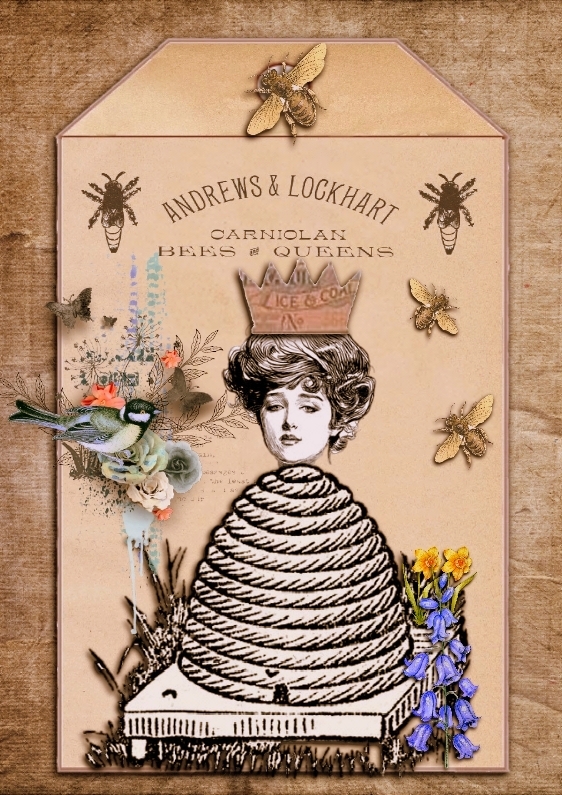 Your family page and Queen Bee tags are beautiful! Love them all!